It’s almost Valentine’s Day again, and people are scrambling for ideas of what to do for their special someone. Romance is in the air, although some may find it difficult to express their feelings in a way that will impress their loved one and melt their hearts. While chocolate is delicious and makes for a nice gesture, Valentine’s Day should be a day of new experiences. Hilton Head Island, Branson, and Ormond Beach are prime spots to visit on your Valentine’s Day vacation. If you are lucky enough to be at one of our resorts this Valentine’s Day, here are some local romantic options for you and your sweetheart. Take your sweetheart out for a romantic dinner for two, and then see a dazzling show! Have an evening of romance and fun at the Hughes Brothers “it” Show, complete with a fun renewal of vows and a free memory portrait. Add a delicious candlelight dinner before the show with flowers and music. Visit Branson Ticket Deals to reserve your tickets and more information on the shows you will love this season. If you’ve been together for five days or fifty years, Valentine’s Day is always special for you and your dearest. If you’ve ever given any thought to renewing your vows, just imagine doing it on the $1 million replica of the Titanic’s Grand Staircase! Take this special opportunity to go back to “the beginning” and look forward to the years ahead together. Afterwards, enjoy the interactive tour at the Titanic Museum and have an exciting adventure with your sweetheart. Get a taste for local and regionally produced wines at one of many Branson area wineries. A nice meal and a glass of wine can set the stage for a wonderful evening for every couple on Valentine’s Day. Visit the Mount Pleasant Winery for a romantic night of Port Tasting with winemaker Colin Pennington. The tasting includes samples of five different Vintage Ports, as well as Tawny Port and a White Port. The Mount Pleasant Winery is offering a Buy 1 Get 1 free Wine 101 class on Saturday, Feb 11th. Call (417) 336-9463 to make your reservation. 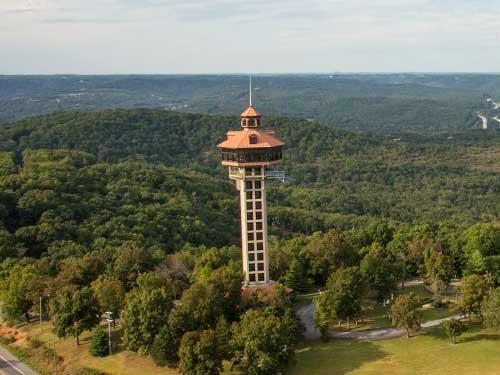 Located at the Shepherd of The Hills Historic Homestead & Old Mill Theatre, Inspiration Tower is one of the most romantic spots overlooking Branson. Standing at the top of Inspiration Tower, you can see more than 90 miles to the horizon. Now imagine being at that beautiful spot with your loved one to watch the sunset. This spectacular panoramic view from the observation deck is the best in the Ozarks. Ormond Beach has 23 miles of pristine white sand beaches, including choice spots right in front of Royal Floridian. You don’t have to go very far to see one of the most amazing sights in Florida. Grab a large blanket and pick a spot for a relaxing and romantic picnic on the beach. You won’t find a better backdrop for your couple’s selfie. Take a day trip over to Washington Oaks Gardens State Park. You and your loved one can hike the trails, explore the beautiful gardens or simply relax on the beach. This makes for a romantic and scenic trip. You can read more about this unique Florida park in our recent blog 7 Reasons to visit Washington Oaks Gardens State Park. Nothing is more romantic and relaxing than getting couples massages at a beautiful spa by the beach. The Angelic Gardens Day Spa’s signature full body massage promotes well-being and is exceptionally beneficial for increasing the level of oxygen in the blood, decreasing muscle toxins, improving circulation and flexibility while easing tension. Visit their website to customize your choice of aromatherapy oils, warm stones and heat therapy. 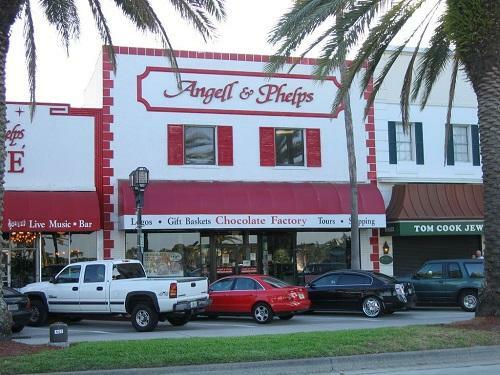 Angell & Phelps has been crafting fine quality chocolates and candies since 1925. Take your sweetie to the sweetest place in Daytona Beach for a tour through the Angell & Phelps Chocolate Factory. Through large cottage windows you’ll view experienced candy makers creating and molding treats the Old-Fashioned way! Visit the Angell and Phelps Chocolate Factory website to make a free tour reservation. Try something new and head out with your sweetheart on a kayak with Outside Hilton Head. Share a kayak and glide along the May River on your own or choose a guided trip. If you’ve always wanted to try paddle boarding, take a naturalist guided stand up paddle tour of the coastal salt marsh. For more information, visit the Outside Hilton Head website. This Valentine’s Day set sail for romance on the Salty Dog Sweetheart Cruise. The evening begins with a sunset champagne cruise around the Calibogue Sound featuring live music with Sara Burns and concludes with a custom Valentine’s Day menu crafted by executive chef Herb Britton. Capture your honey’s heart by literally sailing off into the sunset with The Salty Dog. Really surprise your loved one with a trip into the heavens this Valentine’s Day. Nothing is more romantic than flying over the island to see the gorgeous views below. Hilton Head Helicopter Tours is a spectacular way to view your favorite beaches from a new perspective. Take a romantic horseback ride through the Sea Pines Forest Preserve. Lawton Stables offers trail rides into 600 acres of untouched Lowcountry. If you want to be extra romantic, surprise your loved one with a picnic afterwards. Relax and fall even more in love at the Sea Pine’s Forest Preserve. Whatever your Valentine’s Day plans, make sure you really truly show your special someone how much they mean to you. Make a full day of it by planning multiple experiences together. Just imagine spending the weekend strolling down the beach or gazing up at the stars from the top of a mountain. Shared experiences will last longer than roses and chocolate. Try something you’ve always talked about, but have never had the chance to do. No matter which romantic options you choose, we’re sure you will find the perfect activity for you and your significant other to enjoy this romantic holiday together. How are you and your significant other spending Valentine’s Day at Spinnaker Resorts? Let us know on Social Media.